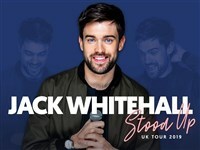 Jack Whitehall said: I couldnt be more thrilled to be going back out on the road. Theres no feeling like standing up on stage in front of an arena full of strangers, and still being able to hear your dad heckle you." Most recently seen in Lasse Hallstrom's The Nutcracker And The Four Realms opposite Keira Knightley, Helen Mirren, and Morgan Freeman, Jack is also set to star in Disney's upcoming Jungle Cruise opposite Dwayne Johnson and Emily Blunt, which is currently in production and will be released in 2020. His television credits include: Decline & Fall (BBC), Fresh Meat (Channel 4), and Bad Education (BBC), Backchat, A League Of Their Own (which received a BAFTA Award in 2014 for Best Comedy Entertainment Program and was nominated in the same category in 2013), Stand Up For The Week, and Live At The Apollo. In addition, Jack also filmed Training Days for Google in 2018, where he travelled the world to interview international football stars - the series was released in the lead up to the 2018 World Cup on his own YouTube channel.